​Pepper’s Sports Cafe: a surprise inside! 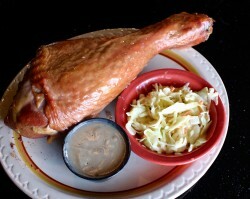 It was rumored that Pepper’s Sports Cafe had something new to offer, something smoky and delicious. A tasty delight that could only come from a prolonged cooking process and a diverse knowledge of meat. The rumors were true, and when I visited on Thursday I experienced a beautiful thing. Well smoked, well prepared, and absolutely fantastic meat! I arrived on Thursday at about 3:00pm. There were only three people in the restaurant. I quickly found a spot at the bar, and ordered a beer. It was extremely cold and delicious. The cup was frosty, and the bartender Tank was welcoming and sociable. We began discussing their new smokehouse menu, and it became very apparent to me how much she cared about the food that they are producing. She is one of two people behind the new menu. The other is Stacey Lavelle. Stacey learned to smoke meat from Dave Newman, an old meat sciences professor at NDSU, and he taught her well. The duo prepares multiple types of meat for multiple menu items, all of which are prepared from scratch, a rare occurrence in the busy restaurant business. 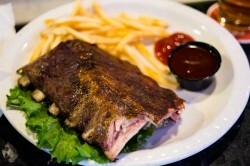 I love ribs, so when I saw a half rack on their menu for a reasonable price, I was inclined to order them. They came with a single side, but I also sprang for an extra side of coleslaw. Cole slaw is a delicate thing, and it seems that every establishment does it a bit differently. Theirs was fantastic, and it was obvious at first bite that they cared about the side as much as they did the meat. It was creamy and mayonnaise-based. There wasn’t too much sugar or vinegar -- it had a balance that sang Americana, a perfect accent to the main event. The ribs were fantastic. There is a tendency in smoking meat to overly salt and cure. Pepper’s ribs didn’t follow this trend. The meat was adequately seasoned without being overly sodium-rich. They were meaty, juicy, and had just the right amount of crust from the smoking process. They quite literally fell off the bone, but weren’t an overcooked pile of mush. The ribs were served with a house-made chipotle barbeque sauce that was on point, not too spicy, but with a sufficient kick. I devoured them. The duo also let me try some of their other creations. The Reuben rolls off the appetizer menu were just as delectable. 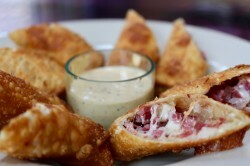 They are as they sound, a crunchy egg roll-like dish with cheese, sauerkraut, and corned beef inside. The unique part of this dish was that the corned beef was also made in-house with their new smoker, and they were incendiary. Served with their 2510 sauce, which is named after their address on University Drive. They are a definite must-eat when visiting. Also shared was some of their pastrami. It was so tender and delicious I wanted to eat it until I couldn’t eat anymore. Once again it fought the tendency to be too sodium-rich, but was still ripe with flavor. The brisket used in their smoked French dip followed suit. The au jus sauce paired with it was drinkable. I’ll be honest, when I entered Pepper’s I didn’t expect this experience to follow. I have been smoking meat myself for multiple years, and I was almost positive that I could do it better, but the knowledge and expertise of the staff proved me wrong. The hospitality, and frank personalities of the staff were almost as much of a treat as the meat. I truly enjoyed myself and I was treated as if I were family. The other good news is that you can bring this experience to your own friends and family, as Stacey also caters with their new subsidiary “Hippie Pig” catering. I was amazed as she showed me images of their new smoker, made specifically for the purpose. The thing was freaking huge, and can support an entire pig practically the size of an elephant. As summer comes they are planning multiple events in the adjoining parking lot and patio. I’m personally excited to eat a smoked turkey leg and drink beer this summer while enjoying tunes outside -- especially because I won’t be the one cooking. 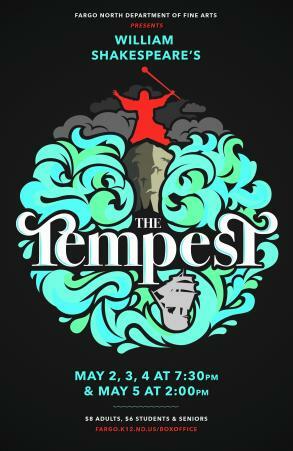 If you have tried Pepper’s in the past and are looking to try their new menu, or if you’ve never been there, check it out. They have beers the size of your head, and their meat will blow your mind.